Overcast by hand all the seams of the lining (three in total). 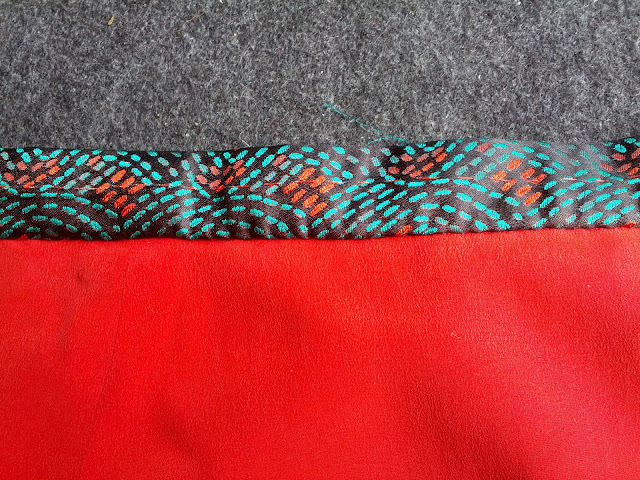 To add some spice to the routine, I used red and black thread to overcast the edges. I pinned Petersham ribbon around my waist to determine the length of the waistband. 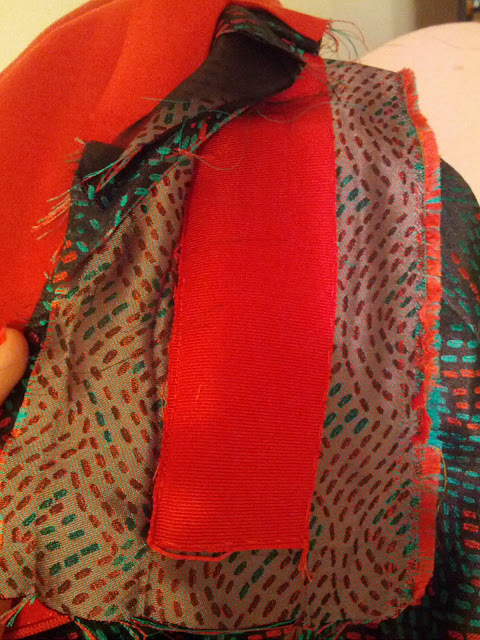 Using the Petersham ribbon as interfacing, I basted it to the fashion fabric wrong side up. Right sides together, I basted the waistband to the skirt. 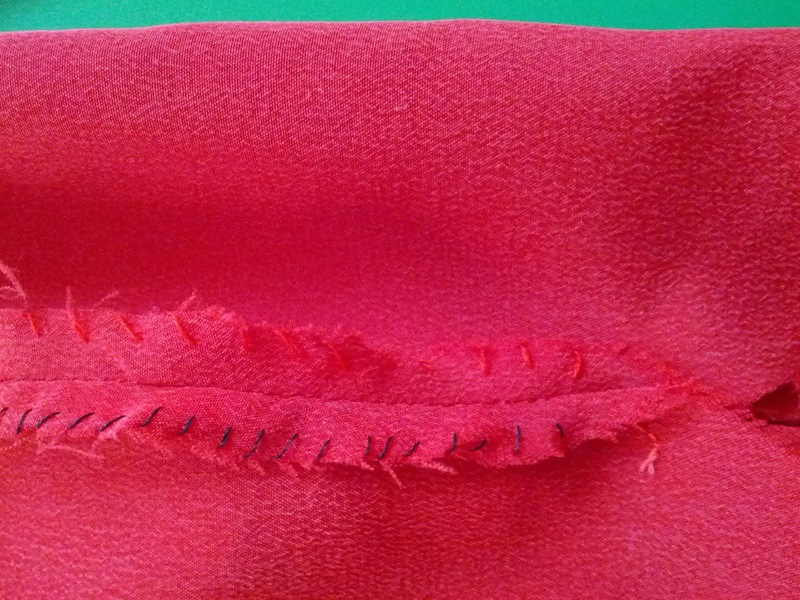 Then I stitched it with my machine (this was the only seam which I machine stitched; all other seams were made by hand). I pressed the seam towards the band, folded the raw edge inside and, using fell stitches, sewed the folded edge to the seamline. So far my skirt is unhemmed and I need to finish the waistband by adding hooks and eyes, but I am so proud of the outcome that I can't help sharing it with you! Outside view. Even though the waistband is not completely finished, I am very satisfied with the end result. Right side of the waistband: OMG I love this fabric! I feel like I learn something everytime I read your blog. I am so impressed with this skirt. Are you hand casting most of your garments now? I agree, the material is GORGEOUS! Wow to your French jacket class. I just checked out the website and it looks fantastic. 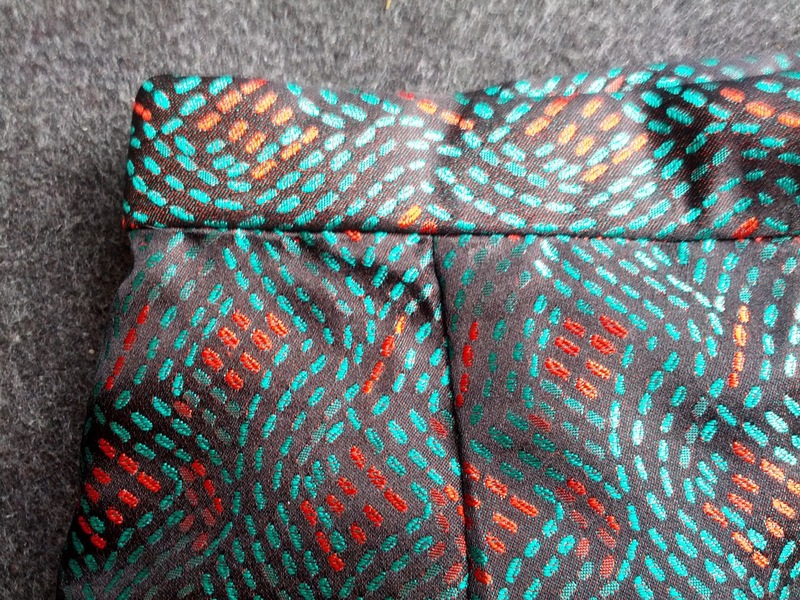 I love the idea of the shopping trip to gather the fabric for your jacket. I hope you will be posting lots of instagram photos so we can all follow along. Enjoy.... oh and it seems that you did end up getting a visa for Canada. Yay! Your attention to detail is getting more spectacular every time you post, Inna! That looks absolutely smashing! Wow, this looks great! Well done! После жаркой Японии (+20C) тяжело смотреть на прогноз погоды в Монреале... Курс будет интересным, сегодня утром начинаем! Because it takes tons of time, I don't apply this technique to all garments, but only for silks or other delicate fabrisc that ravel a lot. For sturdier fabric I use machine finishes or none - it all depends on the garment construction. I think it's good to know different techniques and apply them when it feels logical.